Yesterday I made some homemade bagels and got a few requests for the recipe! There is nothing quite like a fresh bagel still warm and toasty from the oven. They were so so so SO good and really easy to make! I got the recipe from my Dad while I was visiting Texas last month. We had a "Bagel Date" and spent the evening making bagels. It was beautiful. And delicious. It's a simple recipe to follow and you can do it too! Next time I make a batch, I promise to take step by step photos so you can follow along. Mix all of the ingredients in a bowl. The dough should feel stiff, but if you can't get all the flour incorporated add the extra bit of water. Knead the dough for about 10 minutes, or until uniform and smooth. Cut the dough into 8 equal sized balls and rest for 10-20 minutes. Now, we roll the dough into bagel shape, and there are several ways to do this. My favorite is to roll the dough back into a ball and poke through the center. This opens the dough and you can tug the round of dough into the shape of a bagel. Roll the dough into a a little snake on the counter that is longer than the width of your two hands, then wrap it around your dominant rolling hand. Wrap the dough rope around your hand and squish the overlapping ends together. Let the bagels-to-be rest on the counter for 20 minutes, grease a large baking tray, and bring a pot of water to boil. After the bagels have rested they will begin to look puffy and are ready to be boiled. Boil the bagels for a minute on each side, then let them dry out for a minute or two before placing them on the baking tray. Repeat until all the bagels are boiled. Bake the bagels for 10 minutes, flip the bagels over, and bake for another 10 minutes... and Wah-LAH! Perfection. Let the bagels cool for at least 20 minutes before eating them. ...though admittedly, yesterday I only waited 10. I couldn't help myself. they look so delicious. i will definitely try them!! @FeeMail & my best friend jules: Yes! Give it a try and let me know if you have any questions! Also, let me know how it goes! well, i've tried two weeks ago, it was a disaster.. they were very beautiful but very underdone ! I'll try your recipe next week then! well they are very beautiful !! miam ! i am thrilled that you posted the recipe - i'd always been curious about bagel-making, and am so excited to give it a whirl. Ooo lovely - I never realised they were so easy to make! 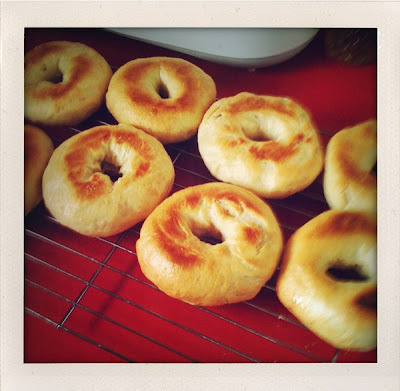 Will definitely have to give these a go, freshly made bagels for breakfast sounds dreamy! Can't wait to make these! How many does this recipe yield? Boiled!! I would have never thought! I've got to try this. Thanks for sharing!